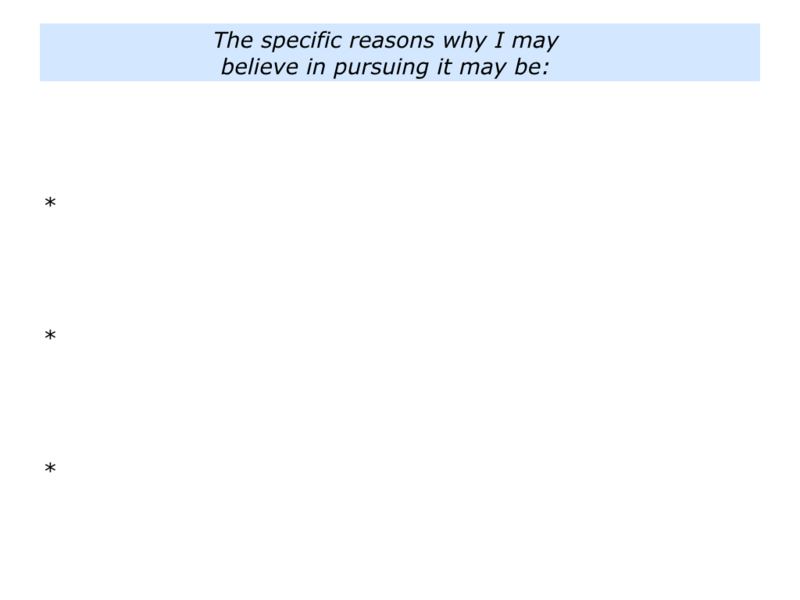 Belief is vital. People will pull out all the stops to do work they believe in. Once the belief goes, however, they may find themselves disillusioned or drifting. Looking back on your life, when have you done something you really believed in and produced good work? You may have been following a passion, encouraging a person, leading a project, creating a certain kind of culture or whatever. What motivated you to do the work? How can you continue to do things you believe in? What will be the benefits – both for yourself and other people? 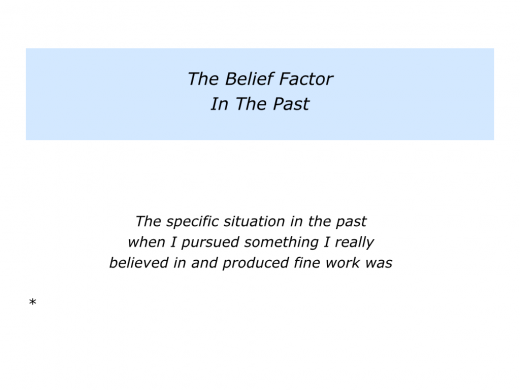 Describe a specific situation in the past when you pursued something you believed in and produced fine work. 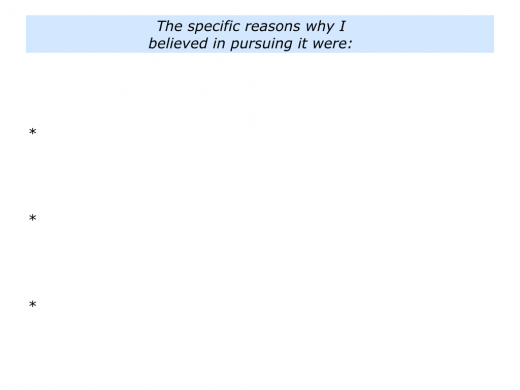 Describe the specific reasons why you believed in doing it. 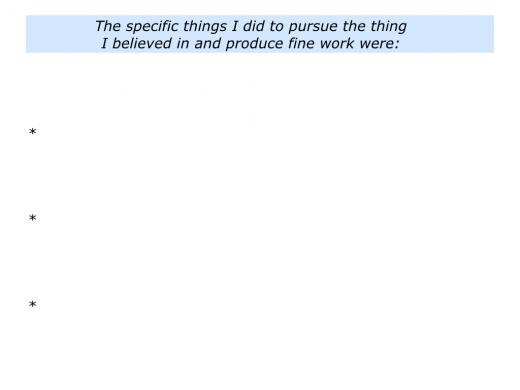 Describe the specific things you did to pursue what you believed in and produce fine work. “I used to believe in what we did as a company,” said one person, “but now it is hard to muster the same passion. “People sometimes find their work goes through certain phases. As the old saying goes, it starts by being a mission, then turns into a career and finally becomes a job. That is what has happened for me. “Over the years I have tried to find or create things I believed in. Three years ago, for example, I led a pioneering project that proved successful. “I still believe in doing work that helps people to shape their future lives. This is what gets me up in the morning. 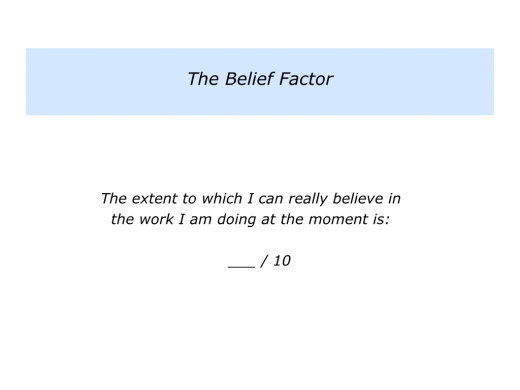 Different people experience different degrees of belief during their working lives. Sometimes they find a perfect sweet spot. The work they do completely matches their passion and professional skills. Sometimes, however, the belief ebbs away. They can then choose which of the following routes they want to pursue. They can find or create something they believe in doing within their present role or organisation. They can find another organisation where they can do work they believe in. They can set up their own business where they can do work they believe in. If you wish, try tackling the exercise. This invites you to do the following things. 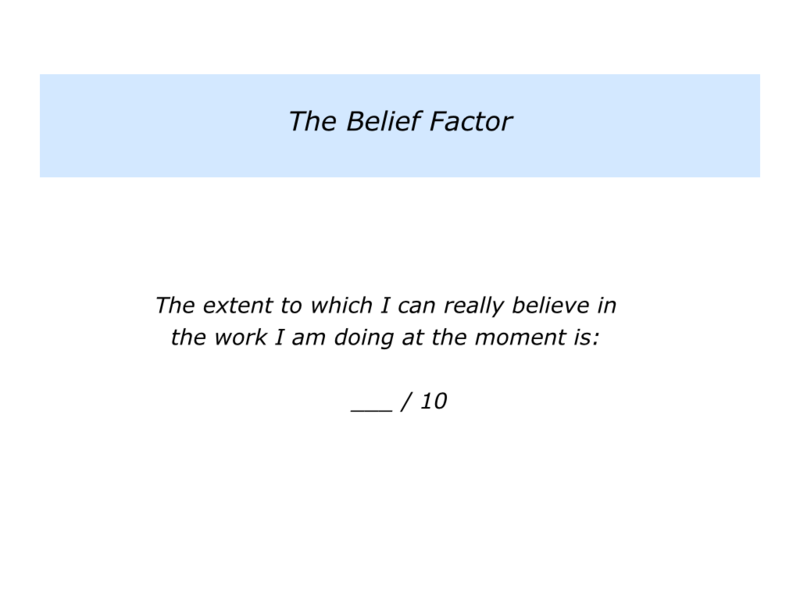 Describe the extent to which you really believe in the work you are doing at the moment. Do this on a scale 0 – 10. 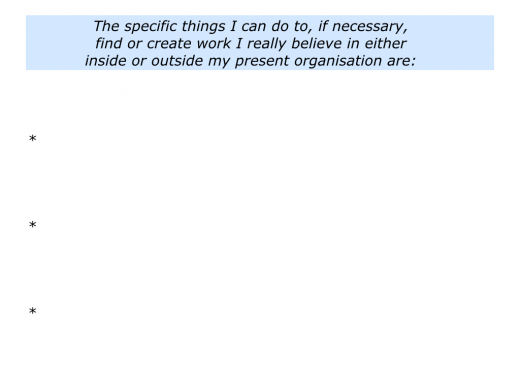 Describe the specific things you can do to, if necessary, find or create work you really believe in either within or outside your present organisation. 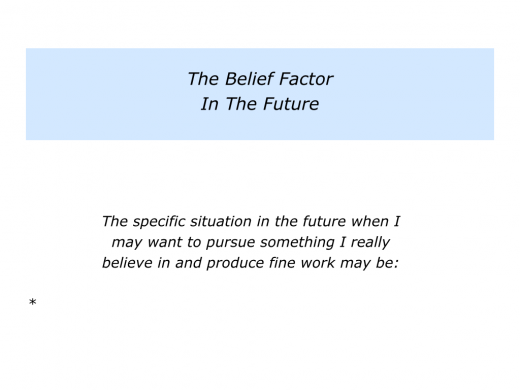 Belief is a vital component for pioneers. During the past 50 years I have worked with many such people. They have been doing pacesetting work in psychotherapy, education, business, sports or other fields. Such people exude intensity and belief in what they are doing. Sometimes they find it hard to maintain this drive, however, if they get sucked into maintaining a business. This was demonstrated several years ago when I had a mentoring session with a serial entrepreneur. Normally he was full of energy, but on this occasion he lacked his usual spark. The entrepreneur had built a successful business that was expanding. He had kept hiring knowledge workers who were great at their work, but unfortunately the daily tasks sometimes did not get done. “I should be out meeting clients. They trust me and want help in finding solutions to their problems. Looking at the challenge, we found ways he could play to his strengths – where he delivered As, rather than Bs or Cs. We also found ways that the knowledge workers could get managed and the practical tasks get done. The entrepreneur hired a great co-ordinator who kept the engine kept running. This released other people to do what they did best. The business is now going from strength to strength. Different people do different things to maintain or reignite their belief. 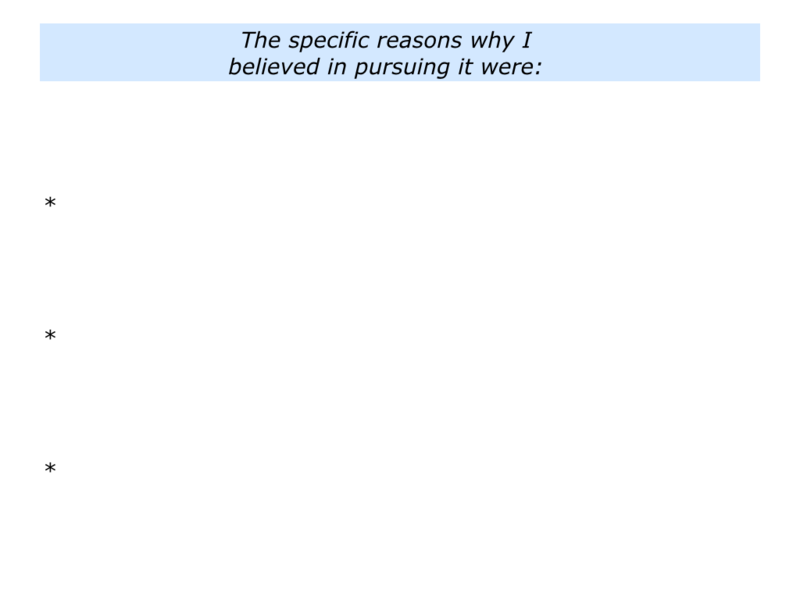 As mentioned earlier, some find something they can believe in within their present role or organisation. Some may follow the path taken by the entrepreneur. They hire people who can complement them, thus releasing them to do what they do best. Some move on to find or create work they believe in. Looking to the future, can you think of something you would like to do that you really believe in? You may want to follow a passion, do satisfying work, lead a particular project, help other people in some way or whatever. Describe a specific situation in the future when you may want to pursue something you believe in and produce fine work. 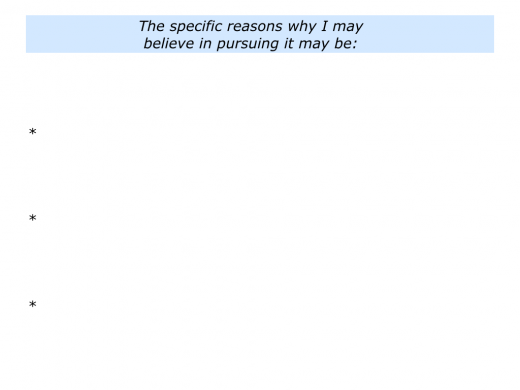 Describe the specific reasons why you believe in pursuing the activity. Describe the specific benefits – both for yourself and other people – of pursuing the activity you believe in and producing fine work.